For the William Tells out there we now offer a 1 hour crossbow session. Using the latest equipment fitted with iron sights or optic sights you will be shooting within Archery GB guidelines. 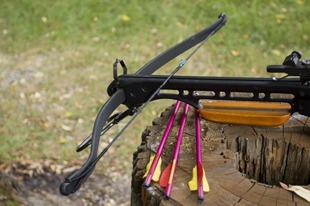 A short equipment introduction session, which will acquaint you with the Crossbows and bolts that you will be using. Our qualified staff will take you step by step through safe shooting techniques, with time to overcome any nerves. The aim of the lesson is to teach you the basics of crossbow shooting.